WestWyck is a sustainable eco-housing development in Brunswick, Melbourne. WestWyck occupies the building and grounds of the former Brunswick West Primary School. The school ran out of students in the 1980s and faced the bulldozer. The WestWyck developers acquired the property with the aim to bring the building to new and vibrant life as an urban demonstration showpiece of sustainable development and good design. This has included engaging a landscape artist as part of the project team. New dwellings are designed to high standards of energy efficiency. Water management regime and systems reduce reliance on mains water and minimising the discharge from the site of water via the stormwater and sewerage systems. Reducing the amount of material going to landfill. Use of benign materials and finishes in the apartments and townhouses. The development is progressing in stages. seven warehouse-style apartments skilfully designed into the classrooms and corridors of the Victorian era school building. all dwellings include a private courtyard terraced area. 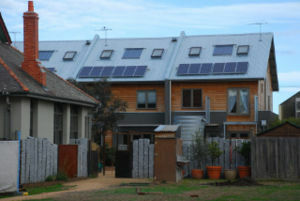 All Stage One apartments and townhouses have been completed, sold and occupied; two apartments have had people living in them since winter of 2002, the pioneers of the WestWyck EcoVillage. Stage Two is in progress. This page was last modified 11:35, 29 March 2009.